I’m coming up on my 4-year anniversary of opening my first Etsy store (which turned out to be rather life changing!) and it got me thinking…I’ve had a lot of fun, scored some great finds and made new friends along the way, but it’s also been a lot of work and I’ve made a host of mistakes. These I share with you now for your edification and amusement! 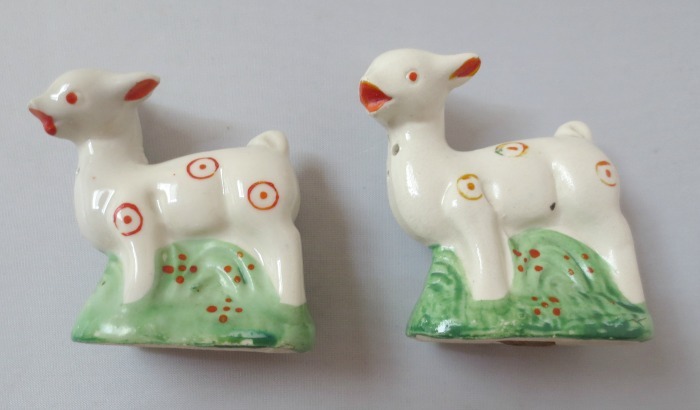 I’ll admit I have bought some things merely because they were a “deal,” like this vintage set of made-in-Japan sheep salt and pepper shakers. They were marked down to $2.50 at the antique mall, and well, that barely buys a cup of coffee these days, so I couldn’t resist. They are in good condition, but really just a bit of kitsch. Maybe I can sell them for $10. Not worth the effort to list them right now. 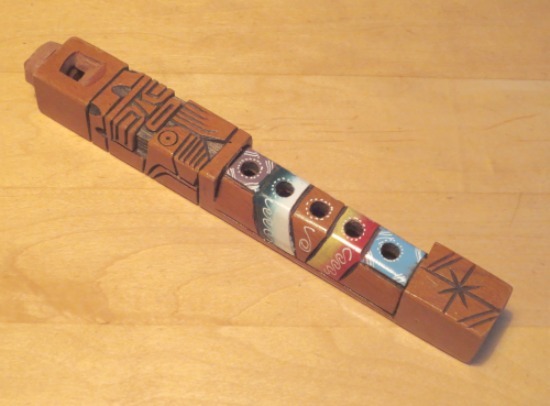 I have no idea why I was so enamored with the little Peruvian wood flute, but I was. I HAD to buy it even though I knew it had little value…and on top of that, I compounded this purchase with mistake #4, paying too much!!! No one wants clothes with holes, crazed china, chipped crystal or musty books. They don’t!!! There have been a few too many times I’ve gotten home with an item and found flaws that made it unsellable or greatly reduced it’s value. Here was one of my book buys that was a bit of a heartbreak. 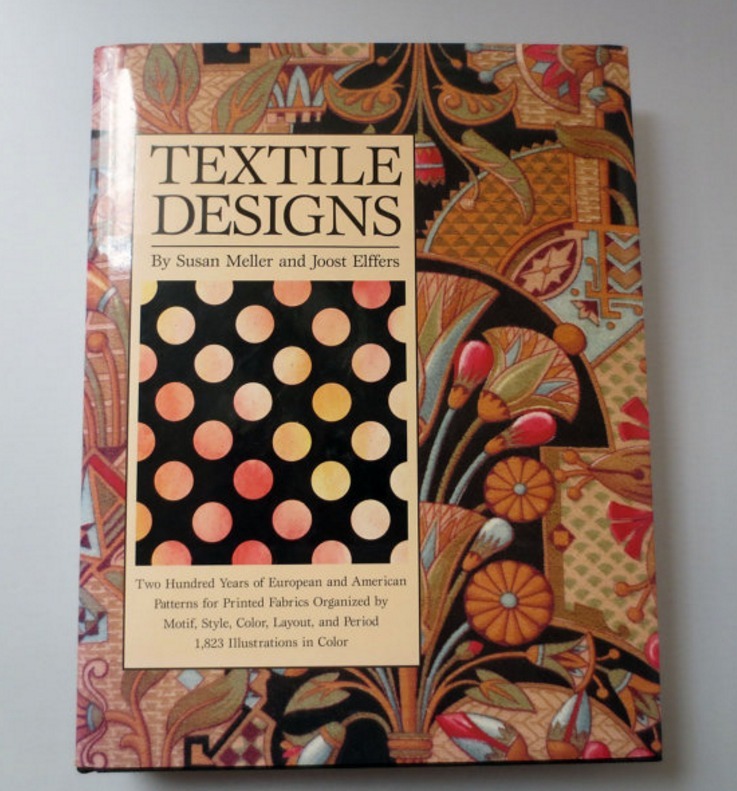 I paid $5 at a yard sale for this 1992 textile design book. It was a fabulous book and I didn’t even try to negotiate because I knew it had value. I got home, did the research and figured I could list it for $45+. Sweet! Then I noticed that one page had been hacked into and partly removed. %#&*^! Why would you do that to this book and how did I miss it? In one fell swoop my potential profit on this book dropped by over half. In the end I carefully razored out the remaining bit of page, mentioned its loss in the listing and sold the book for $22. Still a profit, but I wish I would have noticed before I bought it. Sometimes overpaying is due to ignorance on my part and other times because of mistake #2 (I have become enamored with the item). In the case below, it was a bit of both!! Later I discovered that what I had was actually a string of stones someone bought from a jewelry supply store. 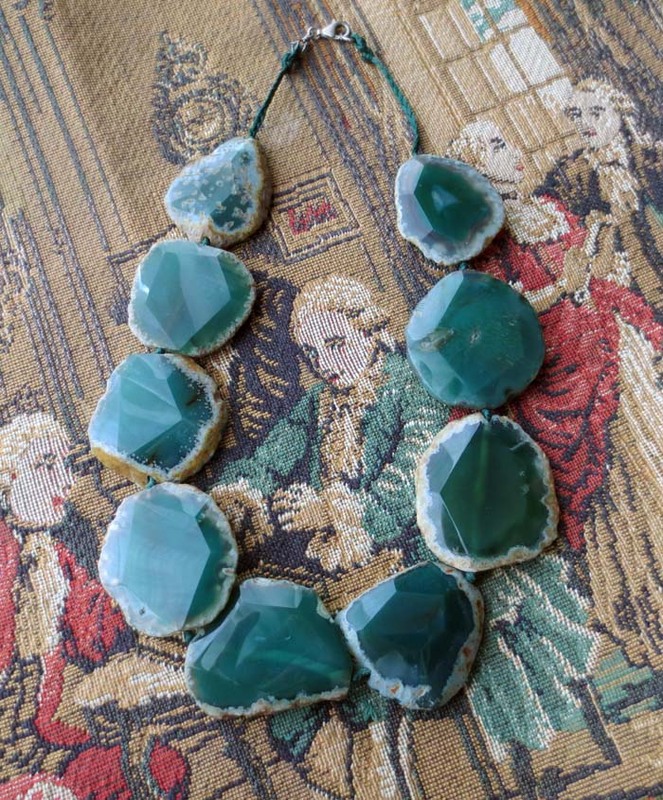 These stones are sold this way as the raw materials for making jewelry. They aren’t intended to be left on the green string. Similar strands sell for $18-35 on Etsy. So trying to sell this as a necklace wasn’t going to fly! I stewed for a while about this purchase. One option–I could sell it as jewelry supply and take a loss. Then I had an idea. 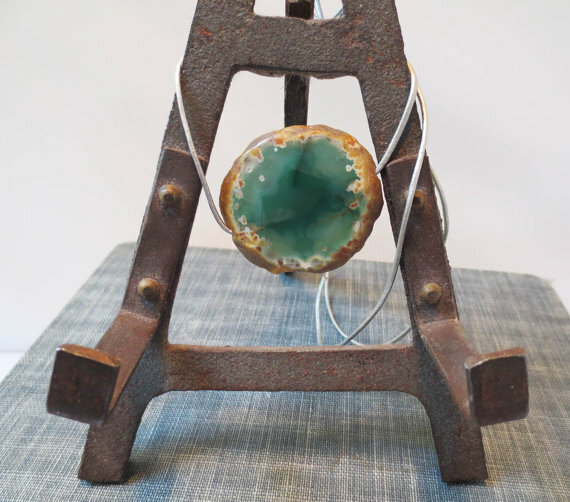 I took all the stones off the green string, bought some nice leather cord and have started listing the stones separately as simple necklaces for $12 each. I sold my first one recently. Maybe, just maybe, I’ll recoup my money and even make a little profit. Sometimes I buy things that are hopelessly out of style. I know this. 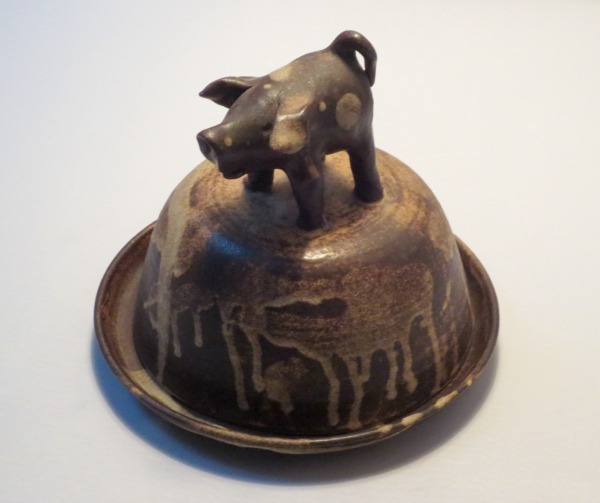 My husband looked at me the other day and said of a recent purchase, “another piece of brown ’70s pottery? !” Why do I buy them? Usually it’s because I am attracted to their craftsmanship and/or uniqueness and I think, naively, that someone else will be attracted to them too. Maybe this brown pig covered cheese plate is just a bit too “unique” and too brown!! Generic crystal dishes are also out of style. 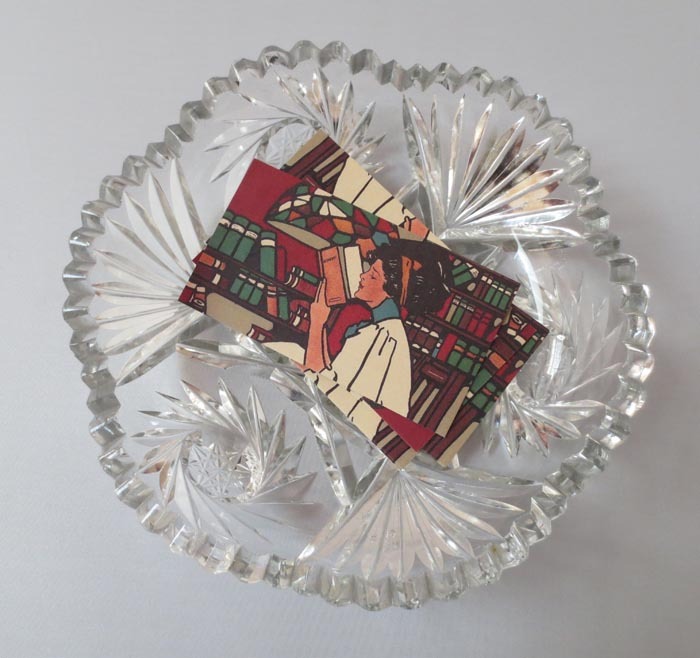 This little crystal dish (which I believe is a nappy or berry dish) was one of my early flubs and rather encapsulates many of my mistakes: I become enamored with it, didn’t check it thoroughly (it has chips), paid too much ($12) and it’s out of style. Estate sales usually have tons of this stuff and you don’t see many people clamoring for it. I keep it around as a reminder of what not to do! Truth be told, every person who buys stuff to resell, makes blunders. They do. But I am getting better at minimizing my mistakes…which is all I can hope for. How about you? Any buying mistakes you’re willing to share?? I know who cut the page out of that book, a Textile designer. Most textile designs are based on historic traditions, and the first step of designing a traditionally inspired new textile is to select some motifs: flowers or paisleys, and arrange them on a tissue. Although it is possible to trace out of a book, if you wanted to change sizes on a copier (or overhead projector, remember those?) it would much easier to cut the page out. I graduated in 1985, but had that same book. I never cut it, but understand why someone might, it was a tool for them. Past life for me, but still love my textile books. I’m subscribing to your posts and I’m thoroughly enjoying them! I think I have probably made all of these mistakes at one time or another. Most of them more than once. Another that I make is not buying something that is a deal, but has no appeal to me personally. I know I have done that way too often and have left money on the table because of it. Many times I have my eye on something and spend more for it than I should cutting into my profit and in turn miss several deals that had potential to be good scores.